Why must sins be paid for? Why can't God just forgive and forget them? Sins must be paid for because sin is breaking the law of God and if God ignores his own Law then he would be approving of sin. To ignore his own law would be to contradict his holy character from which the Law is derived. But, God cannot ignore his own holy character (1 Peter 1:16). Therefore, the Law must be upheld and carried out along with the punishments it contains. In Christianity the punishment is taken care of one of two ways, by Jesus on the cross or by the unbeliever in hell forever. Either way, the law is satisfied. Since sin is breaking the law of God, sin is a legal problem, though not only a legal problem. 1 John 3:4 says that sin is lawlessness. The famous prayer uttered by Jesus where he says "Our Father who is in heaven" is found in two places in the Gospels, Matthew and Luke. In Matthew 6:12 Jesus says forgive us our debts. In Luke 11:4 he says forgive us our sins. So, Jesus equates sin and debt. Since God is holy and cannot ignore sin, then it must be dealt with. The law must be satisfied. But legal debts can be transferred. I could write a check to you for $100 and when you deposit it into the bank, there is a legal transference of money. Likewise, debts can also be transferred. Sometimes banks buy debts owed by people to various organizations and the debt is then transferred and owed to the bank. Likewise, in Christianity our legal sin-debt to God is transferred to the person of Jesus (1 Peter 2:24). He bore our sins in his body on the cross. 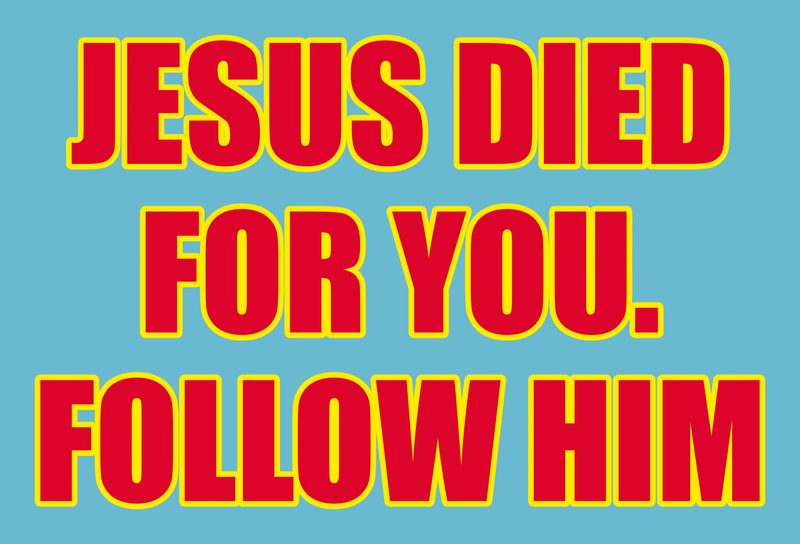 This way, Jesus pays for our sins and satisfies the requirement of the law by dying on the cross. The Bible says that the wages of sin is death (Romans 6:23). But, for all who do not believe in Christ their sins are not paid for by him. They must satisfy the requirements of the law on their own, in hell. by faith in Jesus Christ. is perfectly just, He has to punish sin. He cannot look the other way. deceived! It’s impossible to be good enough for heaven! That is why Jesus Christ (God the Son) came to earth to pay the punishment for our sins on the cross so we could be declared righteous before God. Put your faith in christ for eternal salvation. Jesus said in Matthew 9:13 “I am not come to call the righteous, but sinners to repentance” Good people to to Hell.... perfect people (through Christ) go to heaven. prayer or were water baptized for salvation. profession of faith when i was young because of these types of methods. because i have attended church, learned the church talk and have done good things? again. Today is the day of salvation, get right with God while you have time. in worldliness with a lack of devotion to the Lord. Many false converts are in the church. The following excerpt is from the book entitled Today’s Gospel: Authentic or Synthetic, by Walter J. Chantry. If you are a true convert, this should stir your heart. If it doesn't move you, please consider the implications. Our ears have grown accustomed to hearing men told to “accept Jesus as your personal Saviour,” a form of words which is not found in Scripture. It has become an empty phrase. Those may be precious words to the Christian-–“personal Saviour.” But they are wholly inadequate to instruct a sinner in the way to eternal life. They wholly ignore an essential element of the Gospel, namely repentance. And that necessary ingredient of Gospel preaching is swiftly fading from evangelical pulpits, though the New Testament is filled with it. Churches are being filled with professing Christians who have never heard that Jesus demands repentance of any who seek eternal life. People flock to “accept Jesus as a personal Saviour” without selling all. They have never been told by the preacher that there is a condition placed on having treasures in Heaven--that is, repentance. So the converts of modern evangelism are often as worldly after their “decision” as before; for they have made a wrong decision. The covetous still cling to their riches and pleasures. Wealth and ease remain as the prevailing mark of their lives. True conversion happens when you turn from of your sins and turn to the Lord Jesus Christ in faith and trust. "Therefore by the deeds of the law there shall no flesh be justified in his own sight: for by the law is the knowledge of sin." "Not by works of righteousness which we have done, but according to his mercy he saved us, by the washing of regeneration, and renewing of the Holy Ghost." --Titus 3:5. GOD: NOT OF WORKS, LEST ANY MAN SHOULD BOAST."--Eph. 2:8, 9. "For when we were yet without strength, in due time Christ died for the ungodly."--Rom. 5:6. "All we like sheep have gone astray; we have turned every one to his own way; and the Lord hath laid on him the iniquity of us all."--Isa. 53:6. "Forasmuch as ye know that ye were not redeemed with corruptible things, as silver and gold, from your vain conversation received by tradition from your fathers; But with the precious blood of Christ, as of a lamb without blemish and without spot." --1 Peter 1:18, 19. "For the wages of sin is death; but the GIFT of God is eternal life through Jesus Christ our Lord."--Rom. 6:23. Dear sinner, remember that church membership will not save you. If you have been baptized that cannot save you. Baptism does not save, does not keep anybody saved. It is only an act of duty for those who have already found Christ as their Saviour. A moral life or lodge membership or good citizenship--these must all fail to bring salvation, for it is "not by works of righteousness which we have done, but according to his mercy he saved us" (Titus 3:5). Don't depend, then, on what you do, but on what Jesus did and promises to do for you. Does not the Bible say that we must repent? 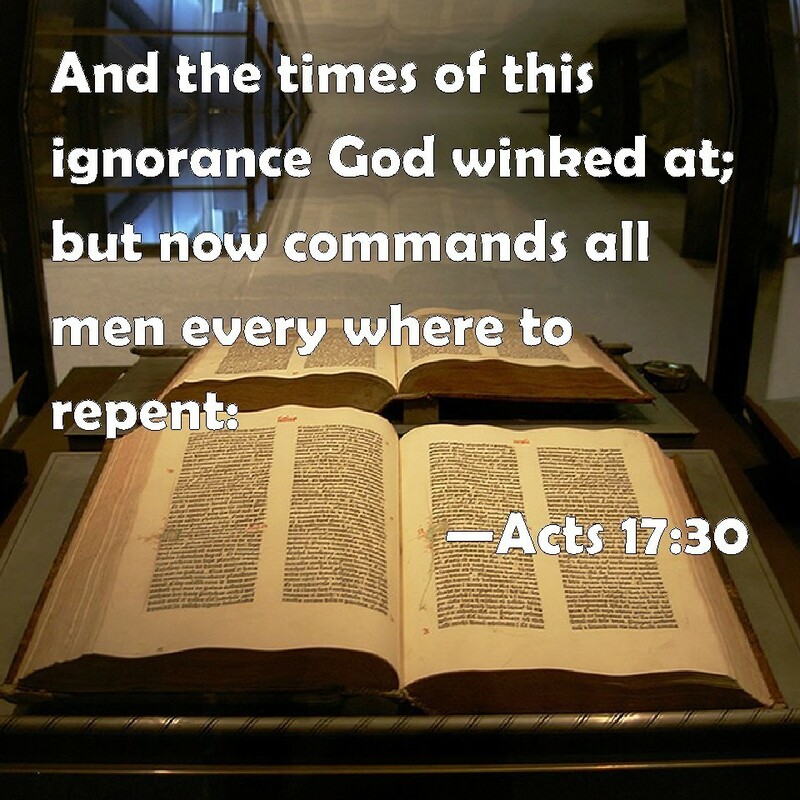 Yes, the Bible plainly says that "God ... commandeth all men every where to repent" (Acts 17:30), and again, "Except ye repent, ye shall all likewise perish" (Luke 13:3, 5). This was the preaching of John the Baptist, of Jesus, of Peter and of Paul, that men should repent. And certainly repentance is God's plan of salvation. The trouble here, however, is that men misunderstand what repentance means, and there has grown up an idea that repentance means a period of weeping and mourning over sin, or sorrow for sins. This idea comes from the Douay Version of the Bible which instead of "repent" says "do penance." So the place of inquiry, where people should be taught the plan of salvation from the Bible, in revival meetings, became "the mourner's bench" and thousands of people have been taught that God would not hear their prayer nor forgive their sins until they went through a process of sorrow and mourning over their sins! You ought to be sorry for your sins and ashamed of them. "Godly sorrow worketh repentance" (2 Corinthians 7:10)--the right kind of sorrow leads to immediate repentance, but mourning is not itself repentance. "Could my tears forever flow, Could my zeal no respite know, These for sin cold not atone; Thou must save, and Thou alone." To repent literally means to have a change of mind or spirit toward God and toward sin. It means to turn from your sins, earnestly, with all your heart, and trust in Jesus Christ to save you﻿. You can see, then, how the man who believes in Christ repents and the man who repents believes in Christ. The jailer repented when he turned form sin to believe in the Lord Jesus Christ. by believing, immediately "while Peter yet spake these words," the Scripture says, the Holy Spirit came on them and they were happily saved (Acts 10:44-48). The thief on the cross, wicked sinner that he was, who a few minutes before had been railing at Jesus, was saved immediately when he inquired of Jesus (Luke 23:42, 43). In the first chapter of John, verses 35 to 49, we see where Andrew, Simon Peter, Philip and Nathanael were all converted, one by one, immediately by faith in Christ. There is no record of any person in Bible times who was ever told to wait, or mourn, or weep over his sins before trusting Jesus and being saved! One who believes in Christ has repented. Repentance and faith are the same thing put in different words, and neither requires a long period of time, nor a process of mourning and sorrow. "For whosoever shall call upon the name of the Lord shall be saved. How then shall they call on him in whom they have not believed?"--Rom. 10:13, 14. The Lord encourages the sinner to pray, and the Lord hears and answers the sinner's prayer, if that sinner trusts in Jesus Christ for salvation when he prays. He heard the prayer of the thief on the cross, of the publican in the temple, of blind Bartimaeus. But the Scripture says, "How then shall they call on him in whom they have not believed?" Certainly every one who is to be saved must believe. Prayer is evidence of faith. No matter how long one prays, if he does not trust in Christ, he can never be saved. If he trusts in Christ without conscious prayer, then he is saved already. There is just one plan of salvation and just one step a sinner must take to secure it. That step is to believe on the Lord Jesus Christ! Some way we preachers have left the impression on this poor world of sinners that God is hardhearted and that it takes many tears and loud cries and long periods of sorrow before He will hear and save the sinner. We have left the impression that God does not care whether sinners are saved or not, and that sinners must some way touch the heart of God and get Him ready to forgive. What a slander on a good and holy God who "so loved the world, that he gave his only begotten Son, that WHOSOEVER BELIEVETH in him should not perish, but have everlasting life." Man's sins are already paid for, God's wrath is already turned away from any sinner who wants to be saved. Both the Father and the Son are a million times more anxious to save every sinner than the sinner can be to get saved! Thank God, I do not have to beg God to forgive my sins. He will do it the minute I am willing to trust it with Him. "For God so loved the world, that he gave his only begotten Son, that whosoever believeth in him should not perish, but have everlasting life." --John 3:16. Some people have an idea that the change of heart is a matter of feeling. Some do not want to claim Christ as Saviour until they have the mysterious feeling that they want. Do not let the Devil deceive you here. I believe in heartfelt religion, and thank God for the joy which He gives to me day by day. But the Bible nowhere tells how one must feel before he is saved, nor does it anywhere say how you feel after you are saved. In fact, people do not feel the same. Feeling varies with the person saved. Be sure you notice another fact, too, and that is that you cannot feel right until you get right. Rejoicing does not come before you trust the Lord. One does not feel the result of medicine before he takes it. The Children of Israel in the wilderness, bitten by fiery serpents and at the point of death, were not healed and did not feel healed until they looked to the brass serpent on the pole (Num. 21:6-9). People are not saved by feeling; they are saved by trusting in Christ. The prodigal son, away from home in the hog pen, decided to arise and go to his father, but he did not feel good. He was without shoes, clothed in rags, without the ring of sonship, without any evidence of his father's forgiveness, perishing with hunger! Yet he arose and came to his father, not by feeling, but by faith in his father. Thank God, his father received him, like God receives every sinner who will come. And when the prodigal boy sat down at his father's table, with shoes of the gospel of peace, clothed in the garments of righteousness of Christ, with the ring of sonship on his finger, eating the fatted calf at the right hand of the father, happy in his love, then he has plenty of feeling. Feeling comes after salvation. Leave the feeling with the Lord and come to the Saviour by faith today. Dear sinner, do not make this a difficult matter. There is one simple step between you and Jesus. When you trust Him, everything else is settled, and you have repented, you have come to Christ, you have received Him, you have done everything necessary to be saved. Take the answer in Acts 16:31 at face value: "BELIEVE ON THE LORD JESUS CHRIST, AND THOU SHALT BE SAVED"! In dozens of Scriptures all through the Bible salvation is promised to those that believe. 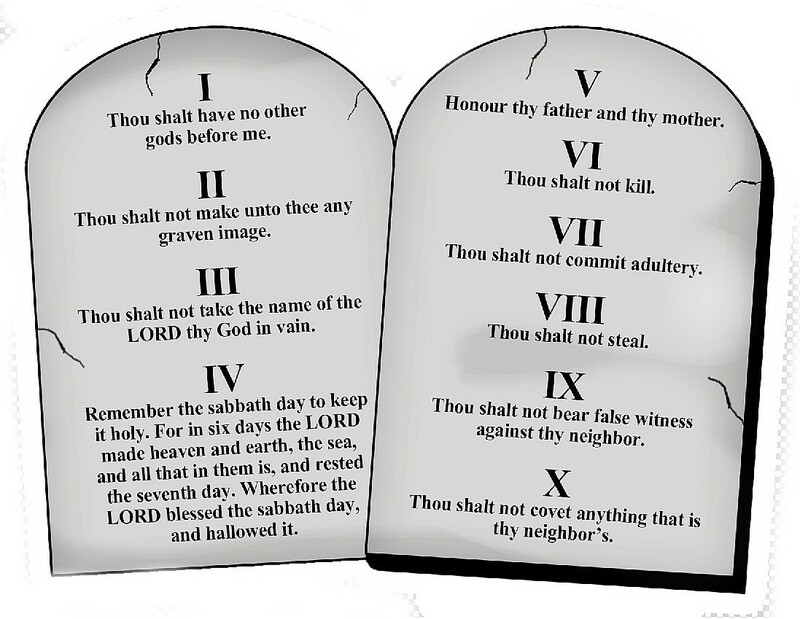 Read carefully the following Scriptures and see that again and again, many, many times, God has promised all any poor sinner would ever need when he believes on the Lord Jesus Christ. "But as many as received him, to them gave he power to become the sons of God, even to them that BELIEVE on his name." --John 1:12. "And as Moses lifted up the serpent in the wilderness, even so must the Son of man be lifted up: That whosoever BELIEVETH in him should not perish, but have eternal life. For God so loved the world, that he gave his only begotten Son, that whosoever BELIEVETH in him should not perish, but have everlasting life." --John 3:14-16. "He that believeth on him is not condemned: but he that BELIEVETH not is condemned already, because he hath not BELIEVED in the name of the only begotten Son of God." --John 3:18. "He that believeth on the Son hath everlasting life: and he that BELIEVETH not the Son shall not see life; but the wrath of God abideth on him." --John 3:36. "Verily, verily, I say unto you, He that heareth my word, and BELIEVETH on him that sent me, hath everlasting life, and shall not come into condemnation; but is passed from death unto life." --John 5:24. "And this is the will of him that sent me, that every one which seeth the Son, and BELIEVETH on him, may have everlasting life: and I will raise him up at the last day." --John 6:40. "Verily, verily, I say unto you, He that BELIEVETH on me hath everlasting life." --John 6:47. "To him give all the prophets witness, that through his name whosoever BELIEVETH in him shall receive remission of sins." --Acts 10:43. "And by him all that BELIEVE are justified from all things, from which ye could not be justified by the law of Moses." --Acts 13:39. "BELIEVE on the Lord Jesus Christ, and thou shalt be saved." --Acts 16:30, 31. If you were sick and about to die, and there was some good doctor whom you could trust, would you not risk him to take your case, give you the necessary treatment, and with God's help get you well? Then just like that, trust in Christ, depend on Him for your salvation, and turn it over to Him today. With the same kind of faith that will call in a doctor and risk him for your body, you can call in the Lord Jesus Christ and risk Him to forgive your sins and save your poor lost soul! He said, "They that are whole need not a physician, but they that are sick" (Luke 5:31). He is the Great Physician and will heal your soul instantly if you will trust Him. As you would trust a doctor, submit to his treatment, depend on him for results, so trust Jesus today about your soul. To be sure, human doctors fail many times. Their results at best are gradual, and so no doctor is a perfect picture of Jesus. The doctor can work no miracles, but Jesus can, and the change that is needed in that poor, wicked heart, He will make immediately, instantly, without any further effort on your part, when you trust Him! "If any man sin, we have an advocate [or lawyer] with the Father, Jesus Christ the righteous: And he is the propitiation for our sins: and not for our's only, but also for the sins of the whole world." --1 John 2:1, 2. What a simple picture of salvation! Jesus is the bridegroom and we who trust Him are to be His bride. Already Jesus has loved you and has long urged you to accept His love. Jesus invites you to accept His love. Jesus invites you to believe in Him right now and be saved and so become a part of His bride. Will you not right now with the same simple faith of that young woman who takes a husband, accept Jesus as your Saviour and say to Him, "I do."? MAKE IT SURE--CLAIM HIM TODAY! "Boast not thyself of tomorrow; for thou knowest not what a day may bring forth." --Proverb 27:1. "Behold, now is the accepted time; behold, now is the day of salvation." --2 Corinthians 6:2. "Today if ye will hear his voice, Harden not your hearts."--Heb. 3:7, 8. One who trusts Jesus Christ as personal Saviour should publicly claim Him before men. "For with the heart man believeth unto righteousness; and with the mouth confession is made unto salvation" (Romans 10:10).